Marcia Williams, the leader of the Independent Caucus who wanted to run against Marilyn Stewart to lead the Chicago Teachers Union, has officially endorsed CORE — the Caucus of Rank and File Educators — in the May 21, 2010 CTU election. Although Jensen Elementary School teacher Marcia Williams (above, center) had run against Deborah Lynch in the May 2004 election, she was unable to get the required signatures to get on the 2010 ballot and has since endorsed CORE. Above, Williams began leafleting the House of Delegates at its June 2009 meeting on behalf of her "Independent Caucus." Substance photo by George N. Schmidt. "I have a pretty good feeling about CORE," Williams said. 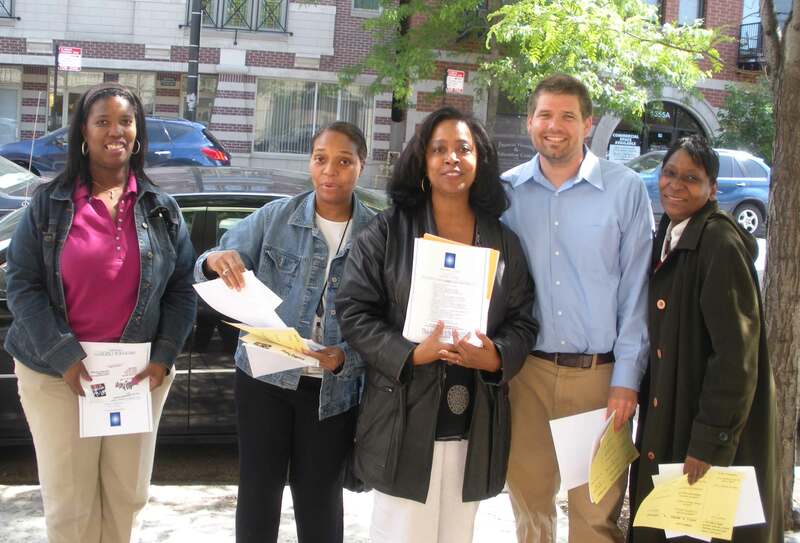 "The teachers were impressed that Karen Lewis (CORE's presidential candidate) was very knowledgeable." Williams said the two main areas where she agrees with CORE is 1) to involve the union members at the negotiating table for the new contract and 2) not take all the financial perks, with "Marilyn living high off the hog." "We're too used to being reactive as a union," she said. "We need instead to be proactive." Williams, who has taught for 26 years and is currently teaching at Jensen Elementary on the west side, first ran for union president in May 2004 against the incumbent Deborah Lynch. The Independent Caucus did not form until January of that year before the May election, but quickly 100 people joined up and convinced Williams to run, she said. She then garnered 10 percent of the vote, splitting the vote between Lynch, the UPC's Marilyn Stewart and another independent candidate, Earl Kelly Prince. Stewart and the UPC won the runoff even though Lynch offered Williams and Prince jobs with the union before the run-off election. Many observers are predicting that none of the five caucuses running for the CTU leadership - CORE, UPC, PACT, CSDU or SEA will garner a majority of the votes, and thus another run-off will take place. "Debby called me, we had lunch and then Linda Porter called me," Williams said. "I wasn't feeling UPC. Even though I didn't like the contract — Debby was like the lesser of two evils, so I declared my support for Debby Lynch." She was also offered a job with the union in the Quest Center before the run-off vote. The Independent Caucus was seen at a couple of House of Delegate meetings this year handing out literature to support their candidate, but were not able to hand in the required number of signatures on the nominating petitions. What happened in 2010 to keep Marcia Williams and her caucus off the May 21 ballot? According to Williams, the CTU leadership knocked off 200 signatures because they claimed they could not be verified, and Williams sent a letter to the AFT — American Federation of Teachers — to complain. But she said it is almost impossible to challenge this since the current leadership running in the election decides which signatures are acceptible. "They used to have another agency check the petitions," said Williams, adding that she hasn't heard anything from the AFT. Williams began teaching the year Jackie Vaughn took control of the Chicago Teachers Union. "The union did everything then to protect their delegates," she said. "They protected you 110%. It was unheard of for a delegate to not come to a (House of Delegates) meeting. Then Tom Reece came and the fever and vigor was wearing off — that was like the beginning of the end for the union. With Reese (the Board of Education) was able to do what they wanted to do and and couldn't with Jackie Vaughn." Williams said the UPC's Reece had a cozy relationship with Mayor Richard Daley and then Schools Chief Paul Vallas, who did much to undermine teachers' rights. She mentioned the 1995 Amendatory Act that took away the teachers' right to strike as a huge blow, and despite Reece and the CTU saying they filed a lawsuit against it, she noted the report has never appeared. "We were going on strikes yearly," she said. "They wanted to take tenure away then. Jackie told the House of Delegates that the FTB (Full Time Basis) teachers who do not have tenure should get certified to protect their tenure." Williams said that she decided to run in 2004 because she thought Lynch took away job security when she focused on giving all teachers the right to be on tenure track, but allowed principals to fire teachers without having to give a reason. The UPC hightlighted that contract flaw to win the run-off election against Lynch in June 2004. But Williams noted that the current contract did nothing to give teachers job security, other then make principals give a reason before laying off a teacher. She also claims to have a 2004 UPC flyer that states "no more five year contracts." Currently Stewart is promoting her five-year contract — with 4 percent annual raises — as a great contract during hard economic times. She as well as the other caucuses are against opening up the contract to give back the 4% raises that Daley and Huberman claim is necessary to help balance the budget. According to Williams, it was better when the Board of Education controlled who was hired at schools. The current situtation where principals hire teachers is not good because they can hire people they know, rather than who is most qualified, Williams said. "My dad who worked 34 years for the Board of Ed said they had the same system in the South in which it was the way some people got jobs and others didn't," Williams said. "He couldn't believe it. He said it was just terrible." Why did Lynch lose as the incumbent in June 2004? "The UPC had a pretty good well-oiled machine," Williams said. She told Substance she knew about fraud. "They were stuffing ballot boxes," she said. "Staff members who didn't come to work, the UPC would write their name on the registration sheet and they voted. She added that the UPC is just as "cutthroat and ruthless" today. "I just don't trust any UPC strong-hold schools, and in the elementary there are a lot and a lot on the southside," she said, adding that poll watchers are necessary. CORE will be sending retirees to monitor some schools were voting irregularities may appear. What does Williams think of the current crop of caucuses vying in one of the most contested union elections in history? "I just can't stomach that Ted Hajaharis, he is such a liar," she said. "He's just another UPCer who decided he wants to be king. I don't think anybody trusts Linda Porter after running with Marilyn twice to no longer have allegiances to the UPC. Debby has her heart in the right place, she just needs to listen and compromise more. The only two I believe who would do things on behalf of the membership are Karen and Debby." And what about the current budget crises in which the Board is threatening to lay off thousands of teachers and increase class size to 35 kids in a classroom? Marica Williams makes a lot of sense. if CORE wins will they negotiate at the United Center? We would not be the first union in the country to allow rank and file members at the negotiating table. It isn't an unusual practice with labor unions in other fields and it is something CORE has learned a lot about through our contacts with other labor unions. This isn't the same thing as calling up every CTU member and asking them if they can show up for negotiations Wednesday at 4PM, but it is a great and effective way of keeping the rank and file informed and active in contract negotiations.